Hello. After a few years of contemplating this decision, I have decided to merge the NAFHA chapter forum toics into The Forum. Here's why. FHF was created with a "global community" approach.....way back in 2004. The world all posted under one roof, by design. This was embraced by the world of field herpers, and continues to be immensely popular this day. Our traffic remains consistent, year after year. Social media has become a great destination for many, but it has barely impacted FHF traffic. I too used FB, Twitter, and Instragram, but it doesn't compare this community. I believe a huge reason for this is the concept of The Forum.....once place for all. In a world of divided sects, we continue to push forward and thrive. That's because of you, and your desire to share with everyone your finds and reports. FHF was a supporter of the North American Field Herping Association (NAFHA). And to be clear, FHF still supports any movement to further advance responsible field herping, advocacy and outreach. In the past couple of years, after viewing multiple discussions from the NAFHA leadership (presidents, mods, and active members), it has become clear that FHF needs to support a general board for NAFHA (like we do for HerpMapper) and get back to our "global forum" community approach which is based on The Forum. All posts from the NAFHA chapters have been merged to The Forum, and can be found there based on the date of last reply or posting. Of course, a search will yield results with your keywords of choice. I understand there will be a few who do not support this move. I have spent years watching NAFHA, supporting it as I can here on FHF. I've received a TON of correspondence about making this move, but have delayed it for at least 2 years as I've wanted to make SURE that NAFHA was in a place for FHF to return to it's roots of a one forum approach. This forum, NAFHA Announcements/Inquiries, will remain as the place for relevant NAFHA items. I know Don Becker still regularly posts NAFHA data requests in this forum. Use it as you wish for NAFHA, a movement I will continue to believe in as a great way to contribute to science and further the growth of field herping! Any questions, please don't hesitate to contact me. I'm 100% okay with this. As somebody who used to regularly check the Southeast chapter and somebody who at one point took a much more active role in NAFHA leadership, I find myself busy with other things (e.g working with the Eastern Diamondback Conservation Foundation). Speaking in terms of even the community of dedicated people in my area of Florida, we are a relatively small community and keeping us all together isn't a bad idea. A few years ago, Scott, you know I was opposed to this, because our subchapter was thriving as a cosmopolitan group of herpers from real herpetologists to beginners, joined at the hip regardless of background, politics, belief systems, etc. 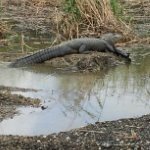 Several of us were cheerleaders to appreciate posts and vicariously shared a new herper's find. Most differences of opinions were resolved civilly. 1. for persons of lesser experience to ask the technical questions about animal IDs, hunting strategies, posting logistics, etc. in the privacy of a mixed group of professionals and hobbyists, who all were new once themselves. 2. Where folks who are within driving distance can coordinate an informal outing. 3. Where a herper could walk out to the car, stumble on a herp in the parking lot, even a common one, and share the simple experience with like minded individuals who can empathize with the uniqueness of the experience, without the post quickly being assimilated or ignored amongst 500 pic mega posts. 4. Where a poster new to herpetology can say “look at these neat herps I found. I have no idea what they are, but they’re cool”, without some arrogant SOB chastising the poster for not using scientific names, or. With the downward spiral of participation in ALL forums, except maybe "photography" and "birds", and the rise in lunatic fringe posts, dumping the regional sub forums is probably the right thing to do. What has changed in my opinion is that numbers 1 and 4 could be handled by some kind of knowledge sharing sub forum and 2 and 3 are probably handled by Facebook. Why isn't this post pinned? So everyone who had the "what the..." moment could read it immediately? Your forum your rules. So be it. I personally dislike the change because it makes finding old chapter subforum posts by scrolling impossible without sifting through thousands of general forum/other chapter forum posts by date that are not germaine to your local region. The cup of water has been dumped into the pool making each original drop from the cup much harder or nearly impossible to locate. I occasionally posted or replied in the general forum or other forums but most of my posts were to the friends I made here on the local chapter subforum. A collection point for bio intros was extremely helpful in getting to know my local herper community over the years and many became my friends and herping buddies. That is now scattered to the wind so anyone new will not have that resource to build local connections. 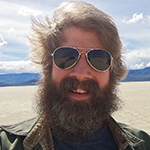 The world community has a very different feel and discussions than the local herping community; while all the posts in all the forums were/are interesting, I liked it compartmentalized so I could go right to where I was interested in most. Our little Rocky Mountain region herp "club" is dead. R.I.P. The age old lumpers vs. splitters argument again it seems, and as always, I am a splitter enjoying my distinct subspecies and recognizable regional variants and hate to see them lumped into a general category. Key word searches are useful if you can remember some of the content of a thread or part of a title of a post per se, but scrolling down the old chapter posts was infinitely easier. A lot of lurkers who only posted infrequently still used the forum on a regular basis to "check out" a specific region and see the animals found by those in the subchapters or see what their friends were up to. Yes the chapter forums tended to be stagnant for long periods and the chapter officer voting requests often were met with silence or crickets but it wasn't really dead; P.M.s and chapter discussion happened periodically, usually trip announcements, trip reports or end of year reports, and I was okay with that. A post or two every month was fine. I feel and have always felt that this website by not hosting pictures and only accepting pictures hosted on other websites was bleeding more regularly updated herping posts to easier user friendly one-click social media like facebook, flicker, instagram etc. but I am a realist and understand the realities of having and upkeeping server space and the cost and effort. That made each chapter post even more interesting because as infrequent as they may have been, someone put some effort into showing their friends or local community their local finds. The hobby itself will not really ever change but how we share our herping with other herpers is always changing incrementally; we have come a long ways from E-mail groups, blogs and chat rooms, but this seems like a step backwards to me as it will push new people looking for local herpers or more specific regional information to other websites rather than to this forum. I would still be interested in a regional chapter membership section for bios even if all other posts were in the general forum or the whatevr the only forum left is called. I still agree with these points and your insight Bill even if your stance may have changed, I feel this move will drive those looking just to join or interact with their local herp community to other websites such as facebook. Oof, I wish I had looked outside the NW chapter forum to see this change coming to deliver some feedback. Even with the NW chapter being less active than it was a decade ago I greatly appreciated that I could search through many years of posts in a NW region specific forum to find regional gems. If anyone knows of anywhere else on the internet that still does a NW or west coast regional herping forum I'd love to hear about it. Great feedback, everyone. Thanks for your input. Here is where I am with regional forums.....I'll do it if they are a direct part of FHF. While I strongly believe in a one-forum approach, which is the origin of FHF (for those who remember our first couple of years). Any ideas to grow field herping, count me in! If you all believe regional forums can be driven, let's do it. But again, as an official part of FHF. NAFHA completely dropped contact with me, along with publicly sharing its lack of chapter relevance. Posts were up asking if they should even exist. Not many responded, so I watched and waited.....for a long time. As the "FHF guy" who hosted the chapter forums I felt it did not advance FHF any longer to have chapters listed with no structure. If chapters are going to exist on FHF now, they should be FHF Chapters so I can support them properly. I was not a board member of NAFHA, I just offered to host chapters. And I did so for several years! I got questions all the time sent to me, "What are these chapters?". For years I had a clear answer, but that was not something I could respond to any longer because I literally don't know what NAFHA is now. If you all want FHF Regional Chapters.....let's rock this out! Mods, logos, stcikers, meetings, jackets, all of it. I say we do it big. Push field Bering to the max. I have, as some of you may know, the Herp Nation website as well. I used to publish a mag, and still host podcasts. Many have not been produced in some time, but I can flip the switch on that any time. Just say the word and I'll get behind this community in a huge way. We can do some great things. Let me know. Oh, and regarding FB. This board style is totally different. Very different. If people want FB, they go to FB. I'm on it as well, but not for the reasons I use a board like FHF. It's not the same, so any comparison to FB is not relevant to me. If this forum wasn't heavily used, I wouldn't operate it. Our numbers have not declined. FHF users are here for the same reasons you are.....because it's NOT Facebook. Again, totally different. Scott Waters wrote: If chapters are going to exist on FHF now, they should be FHF Chapters so I can support them properly. I think this route may be the best way to go. That being said, it's future looks uncertain for now. Keep the NAFHA - Announcements/Inquiries forum active and we'll see where it goes. Regional chapters, SEPERATE from Nafha... are a good idea IMO. maybe cut the nation in four and go with Southwest, Northwest, Northeast, and Southeast. Obviously this only accounts for the United States though. Bottom line, regional chapters are important, they encourage more detailed discussion and get people excited about their local herps! In my mind, "chapters" is not synonymous with "subforums." It sounds like what is being proposed is the generation of regional subforums of FHF; not the same things as chapters of NAFHA which happen to have (had) forums hosted by FHF. The term "chapters" implies some sort of membership beyond registering a user name, and I'm not sure any NAFHA members in any chapter currently pay dues or do anything implying an official hierarchical organizational structure. And therein lies the problem with NAFHA, or at least part of it. I'm comfortable with regional subforums for FHF, but if they're going to be called some sort of reinstated NAFHA forums, that seems more problematic from an organizational standpoint. I'm not trying to say NAFHA is good or bad, but the line of demarcation between FHF and NAFHA needs to remain clear. I agree that regional subforums could fit the niche of more regionally specific questions, regional general information, finds of small outings (e.g. I took a night hike last night and found X, Y, and Z), local ID questions, etc., etc., using the main forum for larger herping trips, like most of those on the main forum now. I think one main benefits for regionals is that folks who live outside the region can ask locally esoteric questions, and local folks can give insights while still not giving away exact locations. I think regional subforums under FHF, would be a good idea. How it is divided doesn't really matter that much IMO. People will quickly figure out where to go for what they're looking for. Regarding NAFHA - speaking for myself, much of the mission of NAFHA still remains with me. I still do many of the same things I did under the NAFHA name and I will continue to do those. NAFHA is as much an idea as it was an organization or set of forums. Quite frankly, FHF could carry the conservation/networking/education torch too, perhaps with much less formality than NAFHA had. We just decide what we want and make it happen. Again, speaking for myself, I don't really know what I want right now. I agree with the above. This sounds like a good direction and reflects the all-to-forgotten "Keep It Simple, Stupid" method. I will admit though, that as a newer forum member I am a bit confused over some of the terms being discussed and there inter-relation to one another (NAFHA and FHF and chapter vs. sub-forum). I know what the acronyms stand for and I have seen first-hand the consolidation that has taken place from an organizational standpoint. But I would love for someone to decode the history of how we got here and give some of the newer forum members enough understanding to better formulate an opinion either way with respect to the forum changes. In any case and with my current/partial understanding of all of this...I favor an approach in line with the quoted post above. I just had the "what the H..." moment. I read the replies in this thread. I agree with Chris McMartin. As NAFHA was never really what could be considered a true "club" i.e., dues, meetings, etc. (at least in AZ) calling it a chapter is a bit of a misnomer. Subgroup or subforum would be the better term to use. I would like to see some sort of demarcation of region, whether it be by state or area under the umbrella of FHF. I agree with Dave, I was a member of FHF when I lived in Louisiana when chapters were still in place. Life took me on a different route(Kids) and I just stopped posting. Now that I am in a better position to pursue my passion, I live in Washington. A place where I have no knowledge of the region. So I joined FHF again to link up with some fellow field herpers through the local chapter. Well to my surprise there are no chapters and I had to resort to posting a message in the forum, like I am looking for a date. No responses yet on that post. I just feel that regional forums/chapters is an asset lost to new herpers and herpers that are new to a specific region. Especially the Pacific Northwest where we are few far and between. Biker Dave wrote: I just had the "what the H..." moment. Would love to work out a good system that keeps with the spirit of the forum, Dave. Hit me up anytime. Message me if you ever want to chat on the phone. IMO, setting up regional FHF forums is a great idea. I can't help but believe that re-creating regional forums would attract more attention and activity to FHF in general. Opening up some regional forums where people can easily interact with herpers from their own geographical regions may serve to bring back some of those lost to FB and the closing of the NAFHA regional forums. How about 6 Regional US Forums: Northwest, Southwest, North Central, South Central, Northeast and Southeast. 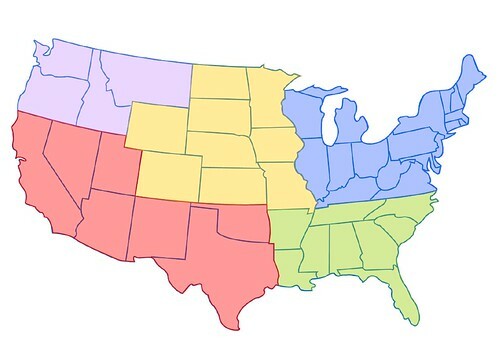 Or maybe only 5 regions: Northwest, Southwest, Midwest (or Central), Northeast and Southeast. Fewer, generally speaking, would be better; at least for those of us who like to peruse all the forums...less clicks. Northwest, Southwest, Plains/Midwest, Northeast, Southeast. But you'll never please 100% of the people 100% of the time--someone will complain that these boundaries don't preserve the integrity of biogeographic regions, etc. One thing I have learned is, you Cannot please everyone. I see the problem with having too few regions is that it sort of defeats the primary purpose of having regional forums. My understanding is that the driver behind the desire to have regional forums is more social than biological. People seem to want a place to share like experiences and connect with other herpers in their geographical areas who are herping in the same habitat types with the same species. At least that's my impression. Hey Steve, I agree with you. Herpetology is my passion. It is one of a handful of topics that I am willing to be social about. But I also need to learn what is in my new backyard. I can go read a book sure, I love to do that, but nothing beats talking with a more experienced herpers from that region. I lived in many states throughout my military career where I relied heavily on the networking with other herpers. Not on locale or anything like that but raw information that only comes with decades of experience. Like handling techniques, identification markers, weather patterns, and so on. So for the only herper in Washington I was able to speak to is technodude. 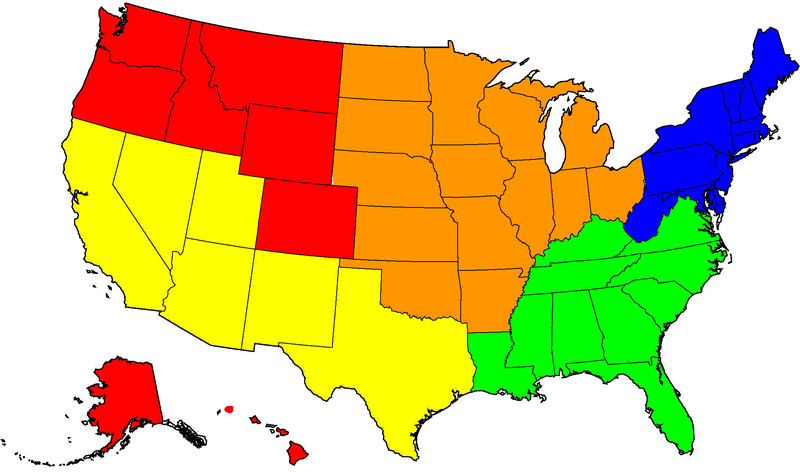 At the risk of either starting a debate, or starting a turf war, here's my idea of what the 5 regions might look like. Steve, I can't see yours, but here's my hastily-thought-out idea--in keeping with my Northwest (as well as AK and HI), Southwest, Plains/Midwest, Northeast, and Southeast suggestion. Of course, subject to discussion and extensive modification. I'm not sure why you can't see my map. Can anyone else not see my map? I used to use Photobucket for 3rd party image hosting, but they just turned that service off to people like me who only use their free photo hosting services. In my case, the only reason I used Photobucket was to be able to post images here and one other website. Doesn't make much sense to me to pay a fee for such little use. Whatever. In regards to your first map, it looks like you and I agree on the states included in the Southwest Region, but differ on the rest. 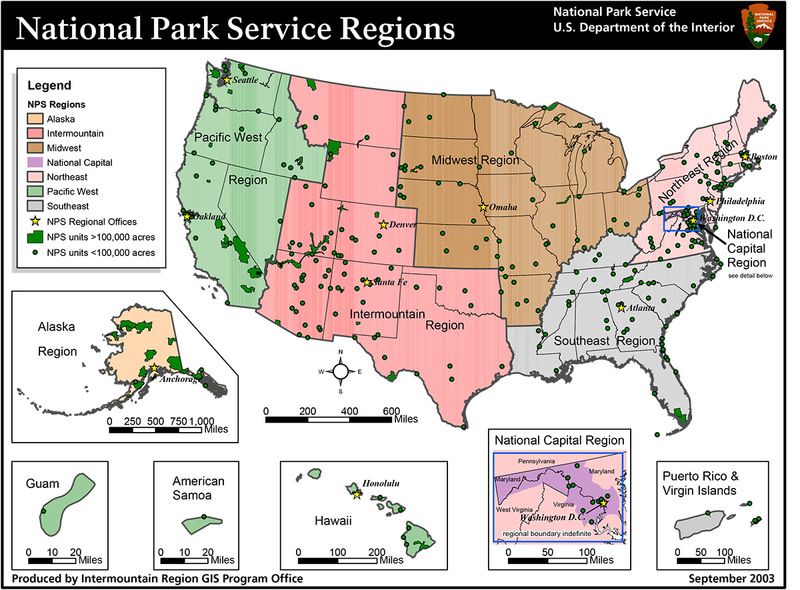 The National Parks map you posted doesn't make any sense to me for our purposes, but I'm sure that if we asked 12 different people, we'd get 15 different answers!! The map doesn't have to necessarily be drawn on state boundaries either. I think it would make more sense to see regions constructed by aligning similar habitat types. For example, habitat-wise, southern California is more closely aligned with Arizona and Nevada in the Southwest, whereas northern California is more aligned with Oregon and Washington in the Northwest. Same could be true with east and west Texas being split between the Southwest and Southeast. I also cannot see your map. Weird...I can see it in your original post AND your most recent one now, too. Good point about not having to limit FHF region boundaries to state lines. About the only "pro" for using state lines is that they may be easier for people to identify regions by widely-recognized boundaries. To solve the mystery, you can see my map now on both of my posts above because I changed the host site and link. I originally tried to host the image on my drop box. Evidently when I do that, I'm the only one who can see it. In my defense, I never claim to know anything about computers! Probably no matter how the regional boundaries are determined, whatever is done (if it's done) I assume might attract more activity. Good stuff. Thanks for the input everyone. I'll put a post up soon with some more thoughts on the subject. It'll be on The Forum, so as to leave this subforum for NAFHA specific use. Another thing that will be happening soon, hoping by the end of the year (at the latest) is FHF Radio. Did it a few times a couple of years ago. Will be bringing that back, posting new shows regularly. A lot of people liked that show, so I'll bring it back.